Nance Van Winckel’s fifth collection of poems, No Starling, is out from U. of Washington Press. She is the recipient of two NEA Poetry Fellowships and awards from the Poetry Soceity of America, Poetry, and Prairie Schooner. New poems appear in The Pushcart Prize Anthology, The Southern Review, Poetry Northwest, Crazyhorse, Field, and Gettysburg Review. A new collection of poems will appear in 2013 from U. of Washington Press. 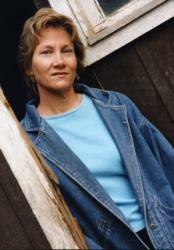 She is also the author of three collections of short fiction and teaches in the MFA in Writing Program at Vermont College of Fine Arts. out of the lake. Bending. Pulling. and turn off the music to hone in. spinning. What hovers at the hooks’ ends? will stick to which name? Or won’t? That on and on of the not germane? The men kneel. They yank and tug. What arrives to eradicate the kingdom? What enters the eye of always?